An original style scroll shooter where deflecting enemy projectiles is key to success. Journey through space to save Earth and destroy your enemies with upgradeable lasers, targeting torpedoes, area of explosion cannons, or deflecting their own projectiles. Aberration got a makeover today in this new release. The heads up display has been redesigned to be more exciting and support the new upgrade system! That's right! Three new upgrades for deflect recharge, integrity, and shield; and that's not all! Upgrades now stack to make each attribute stronger! Graphical sprites for explosions, powerups, and upgrades have been replaced with particles giving you more eye candy to enjoy. Level 5 has been added introducing new bizarre scenery, new enemies, and a new boss! Various changes and bug fixes have been made; however, there is still more work ahead and everything so far is not set in stone. 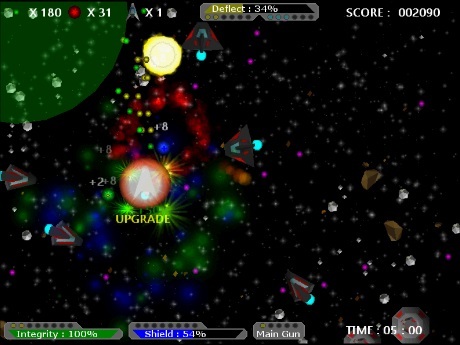 Survival Mode now has life powerups disabled and the probability of other ups increased. The main game still needs balancing with the probability of ups and the price in the armory. Enjoy the latest Pisces Software has to offer and if you have any suggestions, found any bugs, or just feel like it; leave a comment.